Barry attended his first CSO performance in 2007, Lucia di Lammermoor. He was my prop man from that time forward. He also helped to transport singers and occasionally offered housing. 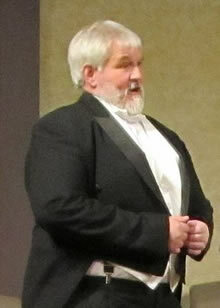 As a young man, Barry won much acclaim for his brilliant tenor voice. He wanted more than anything to sing opera again in later years, and in November of 2011 he finally got his chance to sing in the chorus of La Traviata. He was a very happy man on stage singing the music he loved. This is a photo taken during that opera. We will miss him always. I am sure he will love this production of Macbeth. It's Verdi! We were all blessed to know Barry. We will try to make him proud with our performances of Macbeth.